Learning Ware is a robust cloud-based learning management platform designed to address your company’s learning and development requirements, from e-learning to group training. It is an ideal learning management tool for any group size, whether, department, or organization-wide. With Learning Ware, you can create, distribute, and implement online courses that your learners can easily access and be on top over their entire learning journey. The software comes with a vast set of features including user management capabilities, communication management, scheduling, course management, payment gateway integrations, and more. It is customizable, enabling you to tailor the system per your business and learning needs. Being a cloud-based learning platform, there is no need for additional hardware or install the software into your servers. Learning Ware by ProSeeds has established itself as a learning e-learning system in Japan, and is the choice of over 1,900 companies including Honda, Globis, Family Mart, SysEvo, and more for their e-learning needs, implementation, and management. One of its strongest selling points is that the software continues to evolve and this ongoing development is based on the inputs and suggestions from actual users. That means the software is constantly improved to ensure that its usability, reliability, features, and more meet the demands and needs of its users. 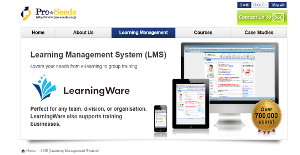 With Learning Ware, it is easy to manage all your users and their information. Communication features such as mass emailing, automatic message distribution, and more enables you to effectively communicate with your learners and ensure that you are all on the same page for a better, effective, and streamlined learning experience. Scheduling is a breeze as LearningWare provides you with scheduling tools with which to manage trainee attendance, journal entries, and employee time-in and time-out. The live delivery system function allows you to see who is present and absent whenever you hold training sessions. This makes it easy for you to record attendance, contact absentees from the system, as well as generate reports for review purposes. Learning Ware is optimized for both smartphones and tablets, enabling trainees to access the system anytime, receive training materials, and learn at their own pace. Learning courses and training modules can be monetized and if you decide to sell your knowledge, Learning Ware allows you to set up a payment system complete with credit card payment, membership registration and billing capabilities to get you started. What Problems Will LearningWare Solve? Many users are required to submit the report about training results of their employees to various government organizations. With Learning Ware, users are able to provide the reports based on the training records and export them in multiple formats with its data exporting functions. Some companies develop their own LMS but that can be costly. With Learning Ware, operational cost for LMS is greatly reduced since the software is usable right off the bat and is based on actual needs of actual customers. Every business has its own characteristics, and may require a special Learning Management System - LMS solution that will be designed for their company size, type of clients and staff and even particular niche they deal with. You should not count on getting a perfect services that is going to work for each business no matter what their background is. It may be a good idea to read a few LearningWare reviews first and even then you should pay attention to what the service is intended to do for your company and your staff. Do you need a simple and intuitive solution with just essential features? Will you really make use of the complex functionalities required by pros and big enterprises? Are there any specific features that are especially beneficial for the industry you work in? If you ask yourself these questions it is going to be much easier to get a reliable app that will match your budget. How Much Does LearningWare Cost? LearningWare’s SMB and enterprise pricing information is available only upon request. Contact the company for more details, and ask for your quote. We realize that when you make a decision to buy Learning Management System - LMS it’s important not only to see how experts evaluate it in their reviews, but also to find out if the real people and companies that buy it are actually satisfied with the product. That’s why we’ve created our behavior-based Customer Satisfaction Algorithm™ that gathers customer reviews, comments and LearningWare reviews across a wide range of social media sites. The data is then presented in an easy to digest form showing how many people had positive and negative experience with LearningWare. With that information at hand you should be equipped to make an informed buying decision that you won’t regret. What are LearningWare pricing details? What integrations are available for LearningWare? If you need more information about LearningWare or you simply have a question let us know what you need and we’ll forward your request directly to the vendor.